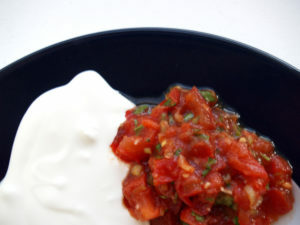 There is nothing better than a fresh, zingy and spicy salsa in the warmer months. This recipe resembles the salsa you might buy at the store, however it’s free of any fillers, additives, and preservatives. Adjust the recipe to suit your tastes – a little less chili, some additional black beans, some fresh coriander. Once you try this you’ll find endless uses for it – dip with corn chips, sauce for your grilled meat, base for home-made guacamole, topper for your bruschetta … so many options. This was originally a thermomix recipe, however instructions to make this without one have been added at the bottom of the page. Add garlic and spring onion to the bowl and chop 5 seconds, speed 7. Add the oil and saute 2 minutes, 100 degrees, speed 2.Add the remaining ingredients and pules 2-4 times on TURBO until your preferred consistency is reached.There is them the option to cook the salsa for 10 minutes, 100 degrees, speed 2. However this is not essential. If you are after a fresher, zestier salsa, then skip this step. Transfer any leftovers to a sterilized glass jar, and keep in the fridge for up to 1 week. Add chopped onion, crushed garlic and oil to a saucepan and cook for 5 minutes over medium heat.To a blender add all of the other ingredients and pulse 2-4 times on high speed until your desired consistency is reached. (If you don’t have a blender, the ingredients can easily be chopped by hand).If you wish to cook this, add the blended ingredients back to the saucepan and cook for 10 minutes while stirring constantly.